These unique and beautiful mushrooms have a distinct taste that’s difficult to describe, but they’re generally described as woody and earthy with a fruity aroma. You can cook chanterelles in a number of ways, but in this recipe I chose to sauté them—either way, cooking them is important as it really releases all their special flavors. This dish features ingredients that both complement and contrast the mushrooms in different ways. 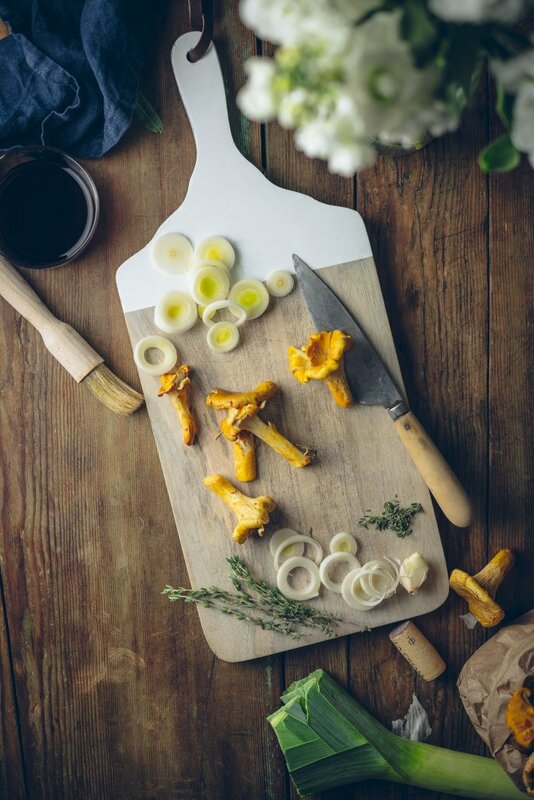 The garlic and thyme bring out the earthy spiciness of the chanterelles while enhancing their herbal quality. The leeks and sweet potatoes introduce an oniony caramel layer that mixes wonderfully with the umami character of the mushroom. And, with a little addition of tangy goat cheese, I’d say you have yourself a quite flavorful meal on your hands. 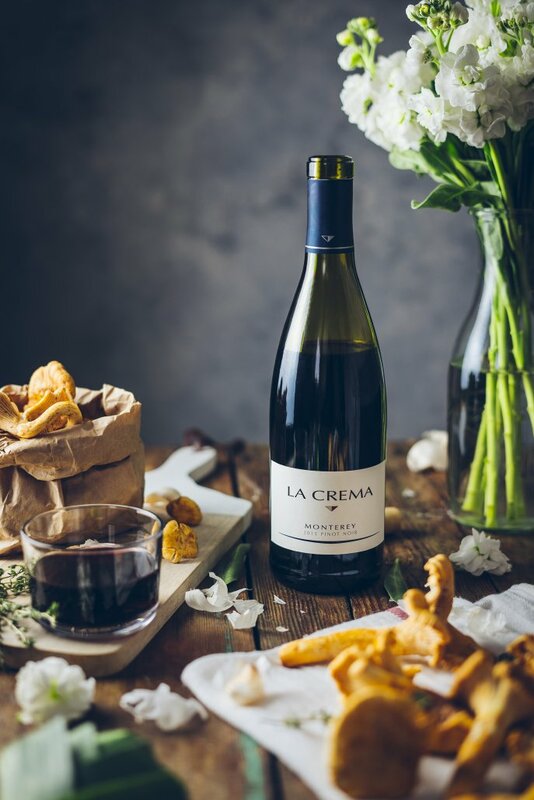 In looking for a wine to pair with this dish, I selected La Crema’s Monterey Pinot Noir. It starts with a layer of spice and evolves into a fruity mix of plum and rhubarb. 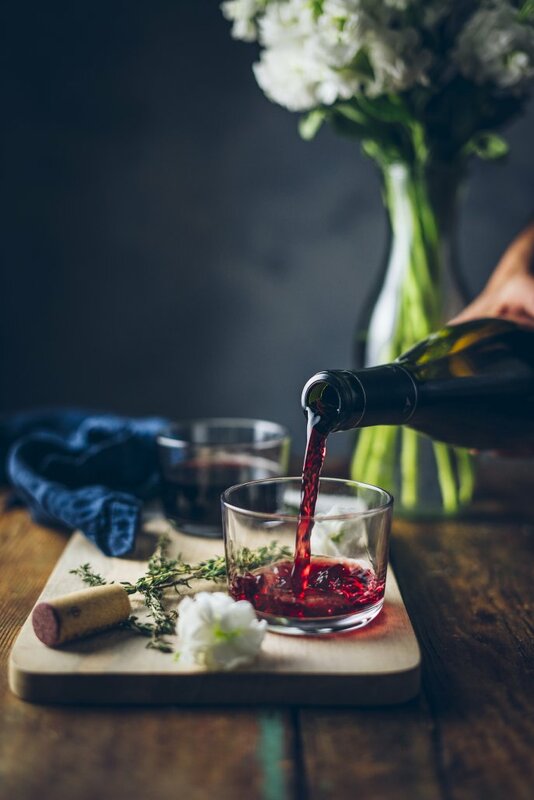 What’s so special about this wine is that it has a lovely umami dynamic and a toasty oak that work perfectly with chanterelles. 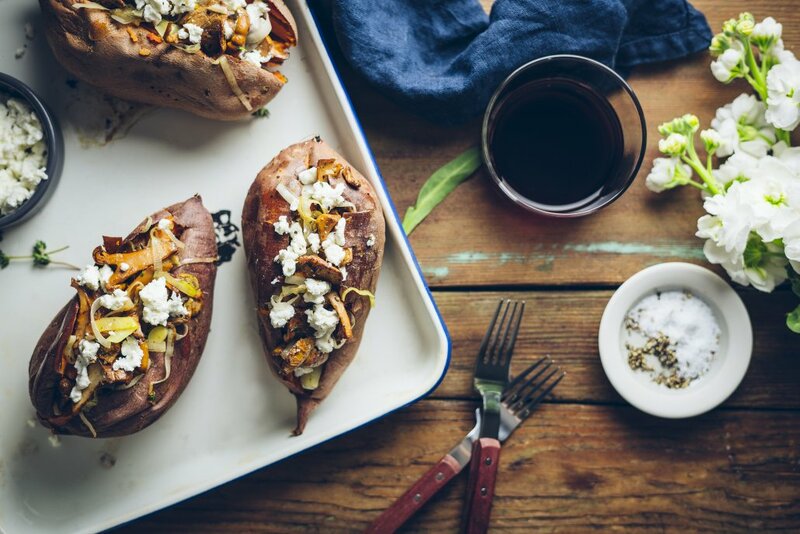 Since I loved these stuffed sweet potatoes so much, I thought it would be fun to create a meat-focused version with chorizo and chard. Be sure to head over to The Broken Bread to get the recipe! Melt the butter in a large skillet over medium heat. Add the chanterelles and two pinches of salt and cook them, stirring occasionally, until the release their water and begin to dry out roughly 6-8 min. Once the mushrooms appear dry and golden brown, add the leeks and the garlic and cook for 2-3 minutes more, or until the leeks begin to soften. Mix in the fresh thyme and season everything with salt and pepper to taste, then transfer to a large bowl. Slice each potato lengthwise and use a fork to fluff up the flesh. 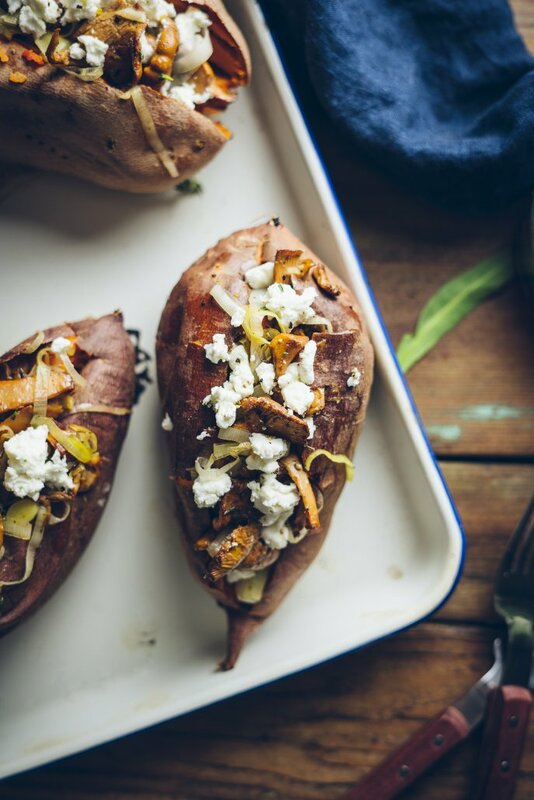 Divide the cooked chanterelle amongst the four potatoes, garnish each with goat cheese, and enjoy right away!